Let's Make T-Shirts Great Again!!! 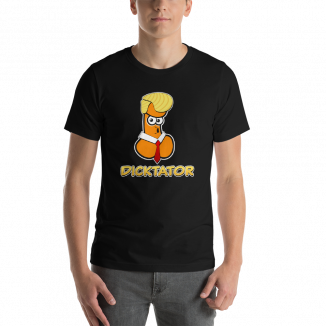 Get Your Dicktator Shirt Today! 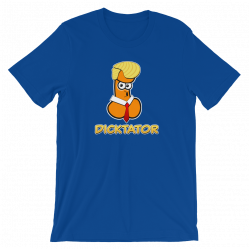 Everyone’s “favorite” Dicktator is now emblazoned on a Tee-Shirt. While the BagOfDicks Dicktator is in fact much larger than the actual “Dicktator” in real life, we think we get a lot of the details juuust right. From the orange spray tan, to the raccoon eyes, to the oversized tie and the puckered paper-thin-lips. It’s the perfect gift for anyone who is a fan of the “Dicktator" or NOT a fan of the “Dicktator"! Unlike our regular BagOfDicks.com Tee’s, this one can be worn anywhere as there’s nothing specific that identifies this as being an actual representation of human anatomy. Get the Size that Fits You! Help Us Make Shirts Great Again! Use the hashtag #Dicktator and tag your friends or whomever. 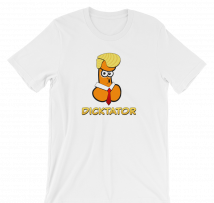 Are you a plain white t-shirt kinda of Dicktator? Blues, oh we got the blues. If your favorite color is red, we got you covered.